Lieh Chieh Machinery (LCM) has been a leading Hydraulic Press and Press Maker for over 6 decades and continues to develop a wide range of very efficient Deep Drawing Presses. Our primary selection of Deep Drawing Press Machines, include both double action and triple action Presses with punch holder, blank holder, and die cushion specifications. LCM is also capable of custom building fully automatic and manual loading Hydraulic Tandem Lines. All LCM Hydraulic Deep Drawing Presses offer high performance, precision, and very safe operations. Deep Drawing Press Machines are primarily used for the forming of automobile parts, LPG gas cylinders, and larger deep drawn objects like sinks and bathtubs. With a wide range of Drawing Press configurations customers can rest assured that LCM can help design and manufacture very high quality machines capable of meeting the most demanding requirements. 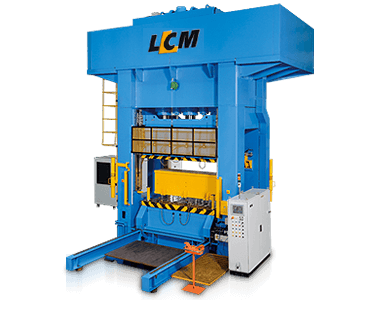 With high investments in research and development, LCM continues to develop very innovative, reliable, and rigid Hydraulic and Mechanical Presses. Hydraulic Deep Drawing Press Machines are able to run at very high speeds while maintaining safe and quiet operations, due to the specialized hydraulic circuit design. Furthermore in conformity with a large range of International safety standards, all our Hydraulic Press Frames are strong enough to ensure precision operations even after prolonged usage.